All things pumpkin spice are coming! Raise your hand if you love it too. It is August 28, which means in four days it will be September 1, which means it is practically fall and that means….well, pumpkin spice. I know that many people are aggravated by all the pumpkin spice things because it really is everywhere, but I have to say that I love (almost) all of them! I love the taste but mostly I love what they signify: Fall is here and that is my favorite time of year. Other things I love about fall…. the changing leaves, the crisp air, cozy wool sweaters, fiber festivals, apples, apple crisp. First and foremost, Pumpkin Spice Muffins from Dunkin’ Donuts. My absolute favorite. I will take a pumpkin donut in a pinch, but they are definitely not the same. And I’m always so disappointed when they are gone for the season. Then there is my favorite homemade Pumpkin Spice Bread from my handy dandy, always trusty Good Housekeeping Cookbook. It has maple syrup in it and I love adding raisins or fresh cranberries. And eating it toasted with butter. Pumpkin Spice Lattes from Starbucks. Can’t get enough of those at the drive-through, so I usually buy the instant ones to have at home. These Via Instant packets are sooooo good. Pumpkin Spice Candles make the house smell so fall-ish and homey…. Then there are knitted Spice Pumpkins! I made seven of these last year and then gave them all away. Hopefully I’ll be back to knitting soon so I can make more. I will also be teaching a class at The Spinning Room this October. They are a cute and quick little project. Here is what I do not like: Pumpkin Spice m&m’s. They are terrible. Here’s looking forward to a crisp-aired, cozy-sweatered, yummy pumpkin-spiced fall! Posted in Uncategorized and tagged pumpkin spice on August 28, 2017 by lizytish. 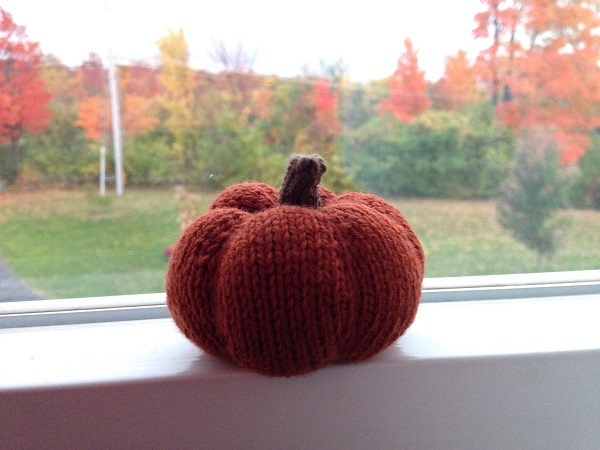 The knitted spice pumpkins are very cute. And do post slow-cooker recipes. I want to start using my slow cooker on a regular basis. And I’ve already noticed the changing leaves. They are definitely there if you look. Will do, Bea – I love my slow cooker! I agree with you about the Pumpkin Spice m&m’s, yuck! Have you tried Trader Joe’s Pumpkin Spice Coffee? I’m eagerly awaiting its return. Haven’t tried it but now it’s on my list! Thank for the suggestion, Sarah!